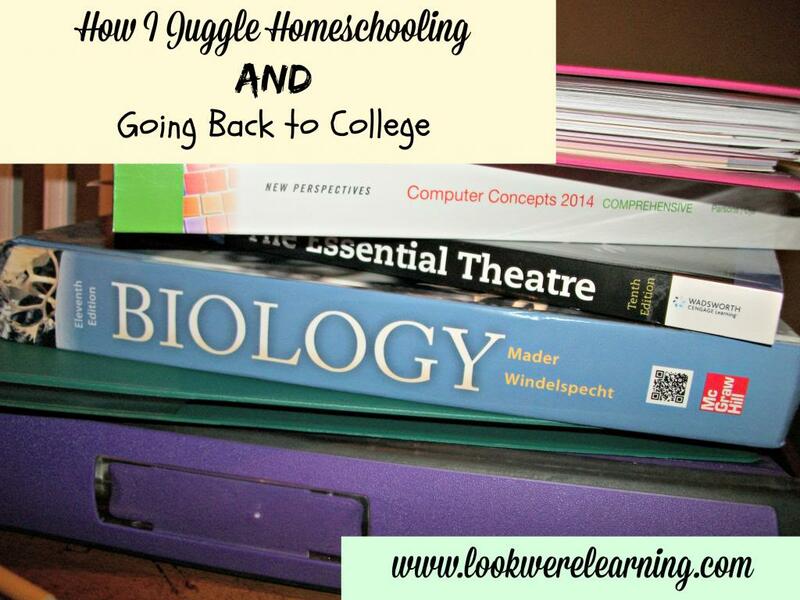 How I Juggle Going to College and Homeschooling My Kids - Look! We're Learning! 1. Insist on a regular schedule. You’ll need at least two schedules: one for your kids’ lessons and another for your own. 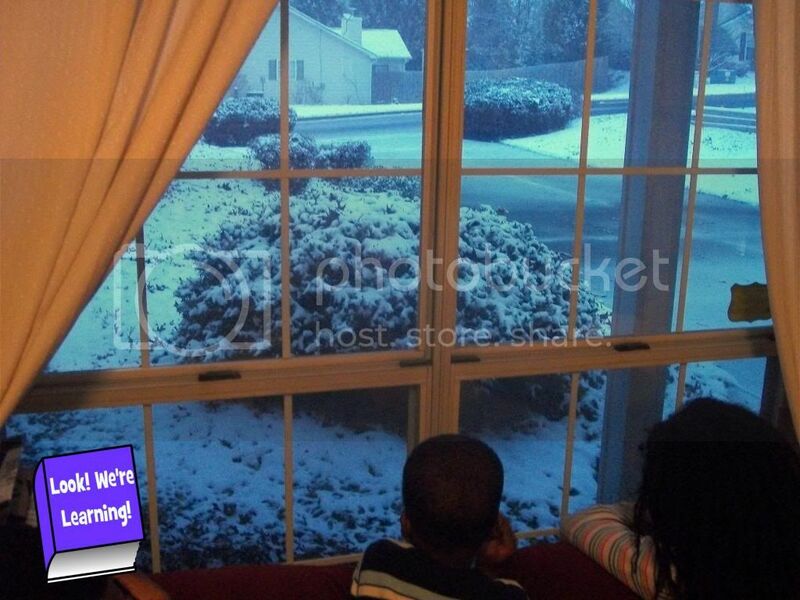 It’s really difficult, but it’s essential that you keep the kids on their regular homeschooling schedule. Otherwise, you’ll finish the semester and then realize that you have to do double lessons for a month to catch up on math (like I have to do with Tigger in May). As for organizing my classes – I have an enormous binder that I use for my classes with sections for each subject and a stack of weekly planning pages in the front. At the beginning of the semester, I look through every class schedule and then write the due dates for my assignments in my planner pages. I usually do this during the first week of class before the really heavy assignments start. I’m usually very organized at the beginning of the semester, but after spring break, it’s all downhill and I’m barely functioning by finals. That’s when the organizing I did early in the semester ends up saving me. Seeing what assignments are due several weeks in advance helps me avoid having to work on them all at once. 2. Enlist the help of your spouse. I’ve written before about why we need supportive homeschooling spouses, and going back to college has just underscored how much I need the help of my husband. There have been many, many school days that he’s taught for me so I could go study. He has no problem cooking dinner or getting the kids ready for bed when I need to cram for a test or attend a school function. In order for our spouses to help us out, though, we have to communicate with them. Jay and I have had several long conversations, especially this past semester, about how we can make adjustments to our schooling schedule while I’m in class. After finals, we’ll be sitting down again to see how I can revise my course load in the fall so that we can get back to learning more as a family. This is probably the most important tip I’ve learned about trying to go to college while homeschooling my kids. I’ve had to be open to trying new approaches almost every week. One of the choices I made was to take classes online, since that was the most flexible way for me to get my school work done. Btw, if you are considering going back to college, I highly recommend distance learning. It’s convenient, easy to use, and adaptable for moms who are already busy during the day. I’ve even had to let go of my attempt to maintain a 4.0 GPA. In the past, I’ve done extra credit and additional assignments to make sure that my grades were perfect. As I’ve gotten older, though, I’ve learned that it’s more important to be reasonable than right. I hope that’s something I can teach my kids as well. So, those are a few of the things I’ve learned while juggling homeschooling and going back to college! Are any of you back in school? Are you thinking about it? We’d love to hear your tips or suggestions in the comments! 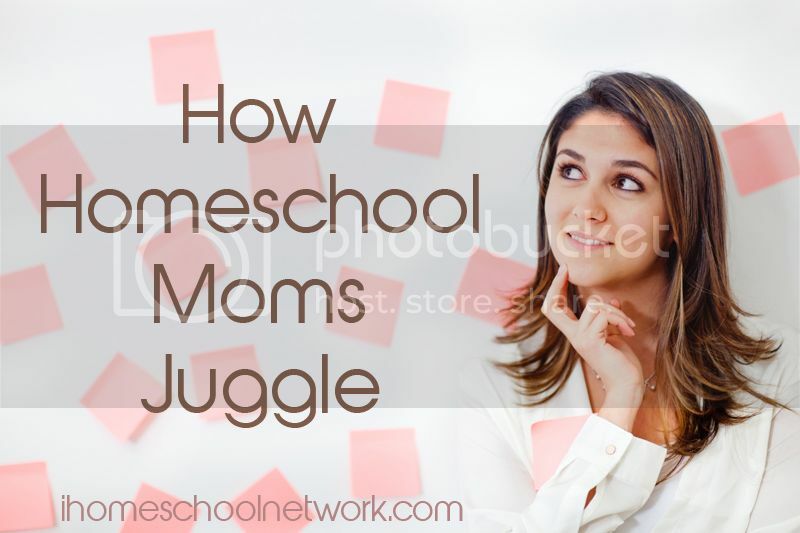 This post is part of the “How Homeschool Moms Juggle” linkup at iHomeschoolNetwork! Click on over and read how our fellow bloggers juggle homeschooling and their other responsibilities such as housework, caring for a new baby, and working outside the home! Wonderful!! I wish my hubby were stationed near us to help me out with college and homeschooling. I just started my MA full time in May. I’m going online and the classes run in four month cycles so I can complete six a year. Its really hard and I struggle with it. This week I’m trying to get ahead of my schedules and get some of the big assignments done before their due dates so I have plenty of time to work on my papers. Good luck to you!! I’m about to do the same. I want to get my bachelors. Great post on balancing everything, Selena! Aww….thank you! And thanks for stopping by! I am back in school pursuing a masters online and will complete my degree next year. At times its been a real struggle juggling my work with home schooling along with teaching online part-time. There have been many times where I wanted to quit school as I felt guilty about not giving enough time to my children. Fortunately I do most of my work at night ( or very early mornings)so I can work closely with my kids during the day. Very good tips – I’m 3/4 of the way done with my bachelors and it has been quite the “learning” experience. Ha! I really want to start nursing school. I’m homeschooling 4 children right now. I’m not very good at time management or self discipline, but I really want this bad. Thank you for your encouragement! Good for you! It’s definitely an ongoing struggle, so I have good days and bad. But when I set a schedule and stick to it, it really does make all the difference in the world. Thanks for visiting! I just started school to finish up my prerequisites for the doctorate of pharmacy program. It’s not easy, but I’m determined and it is possible. I’m so glad I came across your blog! It’s good to know that I’m not the only one with this challenge. I’m going to put everything in my calendar to make sure I’m balancing the family duties with my studying. My hubby doesn’t quite “get it” yet, but I’ll keep talking to him. Thanks for sharing! Thank you, Selena, for this blog post. I am going back to college in my mid-30’s this Spring 2015. Right now my son is young, but he starts preschool this coming fall 2015. I am considering homeschooling him but am worried about how I will be able to do it and still keep up with my college classes – unless I put him to public school. I have only 1 child (so far) and so I can’t imagine doing it with 3 kids – you are a superhero. 😉 Your first tip about making 2 schedules and sticking to them REALLY helped me work some of the issues out in my mind. My husband is a very helpful person and very involved with domestic stuff and helping out with our son, but because he’s in the Army (he’s NOT overseas), his schedule is weird and it changes on a daily basis, so I will be unable to plan on when he will be available to watch our son. One cool thing is that our military base offers hourly childcare, so I could use them for a couple hours here and there if I have classes at the college rather than online. Blessings to you and your family. I just ran across your blog after I did a google search on homeschooling while in college! I have been in college now for 6 months. I have a baby, a preschooler, and a second grader. We put our oldest into PS middle of Kindergarten year when I was going through a difficult pregnancy and then we just let him continue on. I am really praying about bringing him home and having my soon to be kinder boy start at home. My question is , what is the plan for after you graduate? I think that we could homeschool just fine while I am home doing college but I am nervous about what comes after I graduate. 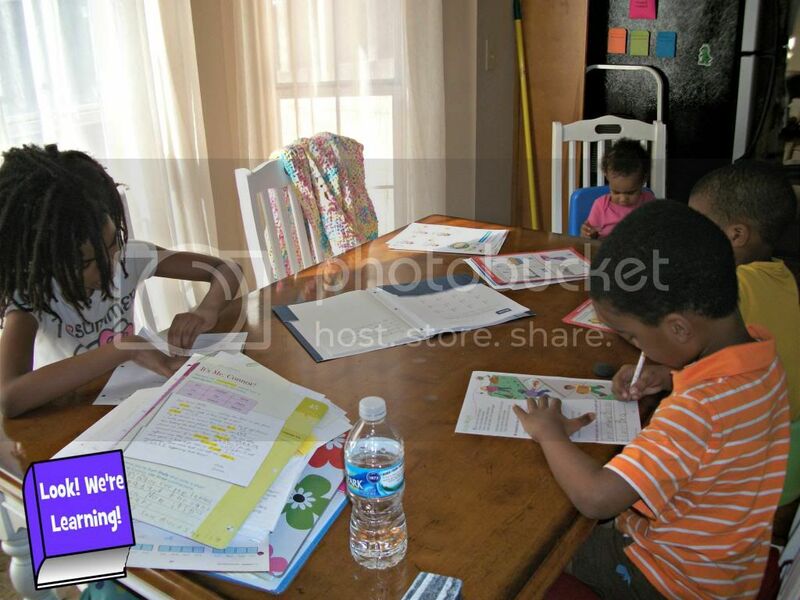 Will you be homeschooling while working? Have you thought about that? Any ideas for me? Thank you! It’s good to know about you handing studies of you and your children. Your story serves as inspiration for many of the homeschooling moms. Happy homeschooling!!! Congratulations on going to college with kids! I know it must be hard to maintain that schedule, but your tips are good ones! Thank you for posting this blog. I was starting to think I was a fool for deciding to homeschool while I’m still in college. I’m 32 and working on finishing my BA. That alone makes me feel behind but it’s all good. I’m a single parent but have a live in boyfriend. Knowing there are other moms like me out there and accomplishing their goals makes me feel better. Good for you! I’ve often seen homeschooling portrayed as something you have to sacrifice yourself to do. And there are some that do. But now that we have options for online homeschooling, college, and more, I think it’s a lot more flexible than it used to be. Best wishes to you! Thanks for this post. I’m considering homeschooling my 4 kids and going back to college for nursing. I was wondering if there were any other brave moms already doing the same thing. Hi Holly, I started college a few years ago when the kids were in school with the intention of nursing. Now we homeschool and I am not in college. I miss it so much but public school isn’t an option. I’ve looked into the nursing classes and they can be any time from early morning until night. Clinicals are also unpredictable. Even with kids in school, nursing classes are several hours after they’re out of school. I don’t see a way to homeschool with a program like nursing. There is one part time program an hour away but it’s a private college and 3-4 times as much. You’d need help with childcare even with them in school. I’m thinking of waiting until they’re in middle school to finish cores and having the kids in a hybrid private school for high school while I’m in college. I’d love to know what you come up with! Hi. What did you do if you had to attend on campus classes a couple of days a week? Hi Rachel! I didn’t have to go to class. That was the only way I could do it. I went to the campus a few times for orientation, events, and consulting with my advisers. Those times I either brought the kids with me or waited until the hubs got home so I could go solo. How do you keep your house clean? I’m taking classes and not even homeschooling and chores are out the wazoo lol I’d love to homeschool my boys…your article makes it sound doable 🙂 do you mind sharing which program you use for them? Are they accredited?